Way to use your freshwater pearls! How many ways can you use your freshwater pearls? Make a choker Pearl Necklace? Or a pair of fabuylous Pearl Earring? Start stocking pearl necklaces from today for your pearl castle. Pearl Necklace by IPEARL is full of possibilities,15-way convertible! 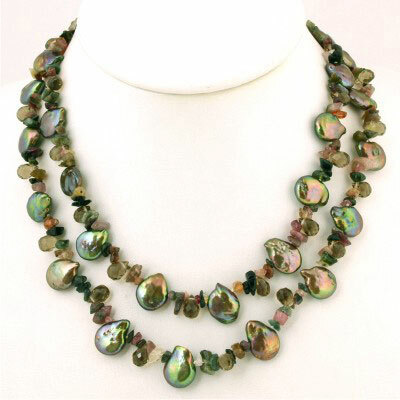 A "must have"
Freshwater Pearl piece presented by BoraBora Jewelry Inc.
of all your friends. The vibrant colors will be sure to get attention! 2. Intertwine the strand and hook to create a new style. 3. Wrap it around your wrist to create a multi-strand bracelet! 4. Wear it as a three strand necklace and you may adjust the lengths. 5. Wear the convertible in a long double strand. 6. 2+2 long strand look. 7. Wear it as a long necklace with a center twist. 8. Connect all four hooks to create the look of a tie! 9. Just twist and tie to create a long lariat look. The beautiful sterling silver hooks look elegant when they dangle. 10. This convertible is worn as a three strand lariat necklace. The hooks can also clip around the pearls! 11. Fabulous 1-2 long strand look! 12. Dangle two strands of the same length in the center to create this look. 13. Wrap the convertible once and dangle two strands to the side for this fancy belt. 15. Wrap the convertible around the waist to create a three-layer belt. 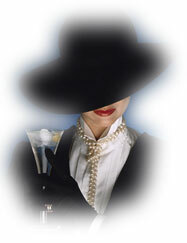 Ubiquitous, yet classy, pearls are virtually everywhere. Recent high-profile pearls include the recent Supreme Court nominee Elena Kagan, as well as Lady Gaga, who famously (or infamously) had them glued to her face, while Sandra Bullock was spotted donning layer upon layer of pearls of every shape and color. Whatever your style or mood, there's always a pearl to suit every woman. Pearls are the ultimate expression of femininity. And with freshwater cultured pearls, the selection of colors and shapes is endless! Freshwater cultured pearls have captured a great deal of the pearl market because freshwater pearl jewelry can be worn much the same way as South Sea pearl jewelry at a fraction of the cost. While it's great to have beautiful cultured pearls to wear on special occasions like weddings and formal parties, women can still operate under the miscomception that pearls are only suitable for special occasions. What they may not realize is that pearls can easily be a casual, fashion jewelry accessory as well. Because of their versatility and affordability, freshwater pearls have made wearing pearls as common as wearing one's wedding ring, or a simple gold chain. Pearl evoke elegance and class. 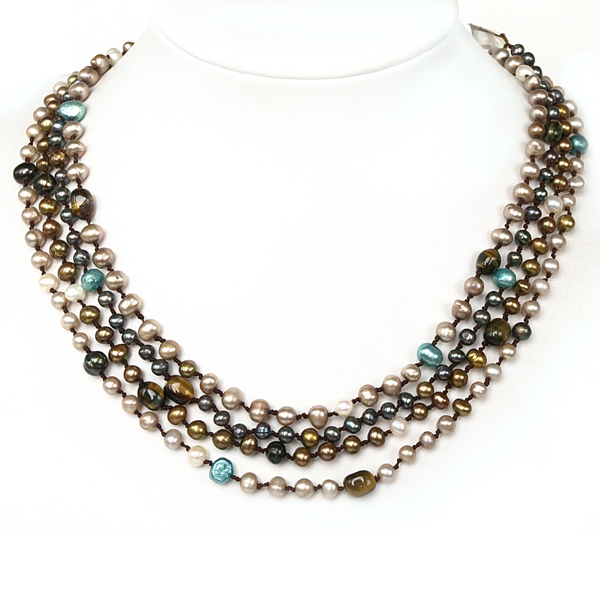 For the office, a business event or lunch with clients, wearing a pearl strand gives a woman a polished, "together" look. Wear them over a cowl neck sweater with wool trousers. Nothing beats a simple pair of pearl earrings. And because of the variety of shapes, sizes and colors of freshwater pearls, you can wear them as studs, or as dangles, paired with a myriad of gemstones. Pearl dangles elongate the face and give it a warm glow. No longer the domain of the wealthy and the mature woman, because of their variety, freshwater pearls have increased in popularity among the "under 30" set. Affordable and versatile, freshwater pearls can be worn equally stylishly by a celebrity, or the girl next door - without breaking the budget. 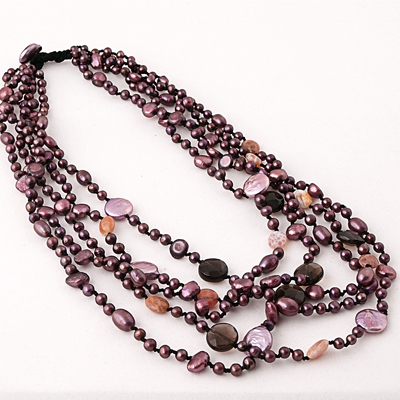 As a fashion statement, nothing is as easy as a long pearl strand that can be doubled, tripled or layered. You can wear freshwater pearl strands with just about any casual wear, from summer cottons to edgy leathers. And because freshwater pearls from BoraBora are teamed with gemstones, they'll never lose their fashion fresh appeal. 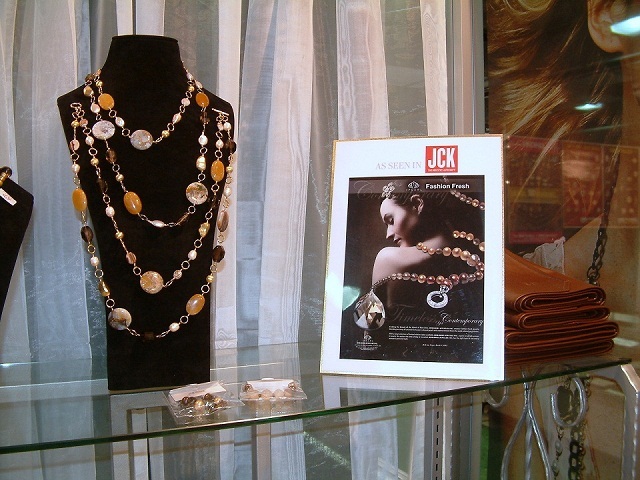 BoraBora's Styles Well Received at JCK! The response at the JCK Show to our current collection of pearl and gemstone jewelry designs, including the introduction of our new "signature" line, was truly overwhelming - with attendance at our booth from resort and jewelry shops to department stores and specialty chains, we were even chosen as a top "find" by a popular TV shopping network! The non-stop "buzz" in and around our booth has given affirmation to our long-held opinion that in today's tough economic times, high-quality, fashion-forward, freshwater pearl and gemstone jewelry is the next platform for high-volume sales in the better and fine jewelry markets. BoraBora Jewelry Goes to the JCK Las Vegas Show! 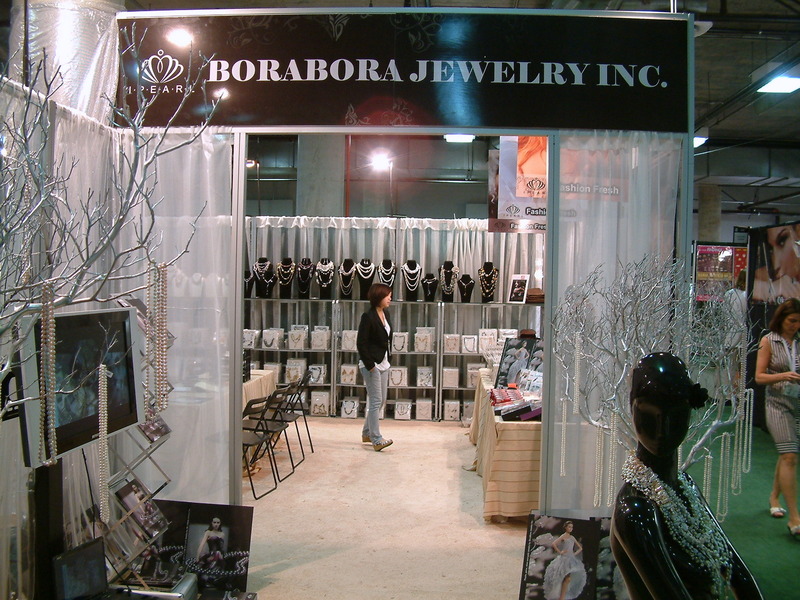 Join BoraBora Jewelry at the JCK Show in Las Vegas. We'll be located at the AGTA GemFair™ Cultured Pearl & Jewelry Pavilion located in The Venetian Resort-Hotel-Casino Grand Ballroom, adjacent to the Sand's Convention Center. Accompanying the BoraBora team will not only be hundreds of current fashion styles, but many new designs incorporating BoraBora's colorful freshwater cultured pearls. Available in over 100 fashion colors, BoraBora's freshwater pearls occupy the fashion forefront in modern pearl and gemstone jewelry. While freshwater pearls have been in the marketplace for over a decade, consumers simply aren't aware that they are available in so many colors. For many years, the pearl-buying public has bought white pearls, black pearls and even highly-prized golden pearls - but who knew there were also naturally-colored pearls in lavender, cream and apricot colors. Many natural color freshwater pearls also have an almost metallic luster that makes them a truly unique. In larger sizes (over 9mm), these highly-prized natural color freshwater pearls can command prices rivaling their South Sea counterparts. Along with natural color, freshwater pearls can be found enhanced in an array of colors ranging from yellow to peacock. The range of color available in freshwater pearls makes them extremely versatile for gracing both fashion and fine jewelry. At BoraBora jewelry, we combine over 100 colors of freshwater cultured pearls with gemstones to create stylish jewelry that will stand the test of time - and fashion trends. Who Says Pearls are Boring?! On a recent Oprah program (where Oprah called together her "inner circle" of Dr Oz, Dr Phil, Nate Berkus, to name a few), her personal stylist commented that "pearl studs are boring." 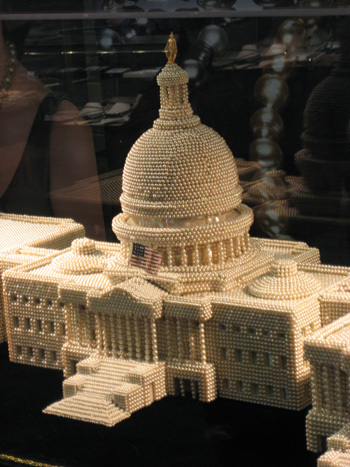 While many may still think of pearls as "only white," they are neither that, nor are they, as he proclaimed, "boring." Think of all the women who we've noticed because of their pearls - Grace Kelly, Jackie Kennedy, among others - and have admired, even many decades later. Their sense of style and elegance has become timeless. Despite passage of time, their style has been emulated, and continues to be to this day. One of our highest profile style trendsetters, Martha Stewart is on board with pearls. On her May 17th program she featured J Crew's new Manhattan wedding retail store (complete with fashion show). On the runway stepped a flower girl, bedecked in multiple strands of pearls. And as the segment wrapped, Martha offered each member of her audience a strand of pearls, courtesy of J Crew. We thank you, Ms Stewart, for acknowledging that pearls will always remain a woman's most feminine fashion accessory! It's springtime, the sun is out, and what better way to greet the day than with a strand (or two, or three or ....) of freshwater pearls? Through technological innovation, Bora Bora Jewelry has taken freshwater pearls to a new level! 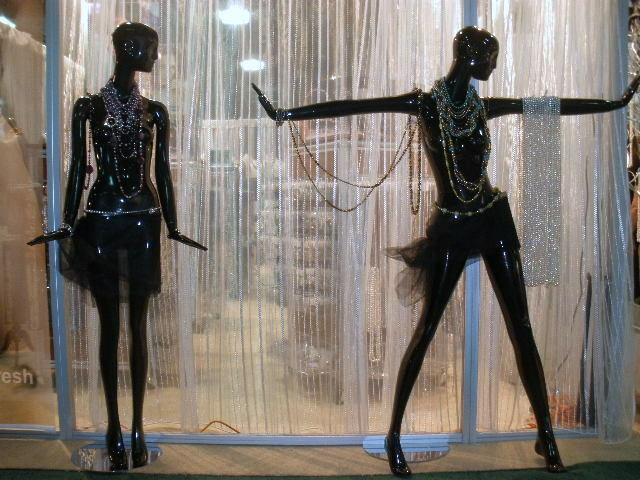 No longer confined to the traditional South Sea pearl colors (black, silver, peacock, golden, white), freshwater cultured pearls come naturally in many colors including black, peach, gold, pink, lavender and white. They can also be enhanced to create a myriad of fashion colors, from glowing emerald greens to chocolate brown. So now that you've broken out all the spring and summer colors from your wardrobe closet, don't just grab the white pearl necklace - go for the gusto and choose from a rainbow of colors at Bora Bora Jewelry! Moms everywhere deserve tender loving care, and what better way to say it than with pearls! Whether it's your sister, wife, mother or daughter, a gift of pearls will always bring a smile to a lady's face. Pearls appeal to all generations and possess timeless versatility: they can be worn with virtually anything, and at any time. 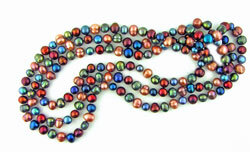 This Mother's Day - give the gift of pearls from Bora Bora Jewelry. One aspect of pearls that distinguishes them from other gems is the fact that they are uniquely feminine. Against the grain of conventionally mined gems' angular features, pearls are found in many wonderfully curvy shapes - just like the women that wear them. 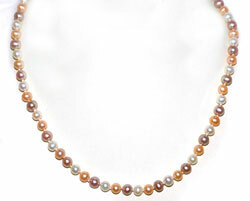 Recent technological advances have resulted in freshwater pearls being cultured in a wide range of pastel colors - among them pink, peach, lavender, golden, peacock, cream and white. Because freshwater pearls culturing is more productive than South Sea pearls (12-16 pearls per mussel), they are more affordable than their ocean counterparts. Their versatility is endless - they can be combined with a wide array of gemstones, or strung in traditional pearl strands. Pearls are timeless. Wear them today, or wear them 20 years from now. They never go out of style. BoraBora Jewelry Inc. designs thousands of fashionable Freshwater Pearl Jewelry styles, amongst them Multi Strand Pearl Necklaces, colorful Freshwater Pearl & Gemstone Earrings,stylish Freshwater Pearl & Gemstone Bracelets, and Freshwater Pearl Pendants and Pearl Brooches . Copyright © 2008-2019 BoraBora Jewelry All rights reserved Powered by BoraBora Jewelry Inc.